I have been working on chemo hats for the Children's Oncology wards at Westmead. Three wards, each with baskets for donations. My son can drop them off in the afternoon even if Miss M is not an inpatient, as he works nearby. Hats are always needed, they treat many hundreds of children with cancer a year. Miss M was reluctant to try my hats at first as she had tried the donations and many were knitted with yarn which felt scratchy to her. She wasn't keen on the acrylic either. 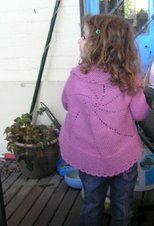 However, she knows I use good yarn and is happy to wear what I made for her. She's also happy that any I donate are made from good quality yarn too. They are a great way of using up stash yarn. Heaven knows I could knit hundreds and not need to buy yarn. I find that knitting a variety of hats makes them less boring. So there are stripes, ribs, some lace, different styles. The yellow and grey are made from Bendigo five ply and are quite soft. 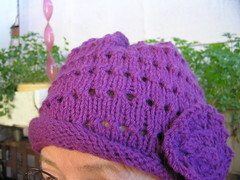 The yellow is a beret style with a picot edge. The grey is the pattern Coronet which is free on Ravelry, although my pattern was downloaded well before Ravelry in 2003. It's originally for 8 ply but using 5 ply downsized it automatically for me. I'm going to make Odessa for the next hat. Again, it's an old pattern to me and I have made quite a few. No beads though, I don't want a tender scalp to be irritated by them. The other two are made from Quince and Co in Owl or Owl Tweet. That's an Aran weight. I cast on eighty stitches, knit till it looked around the right length and decreased. 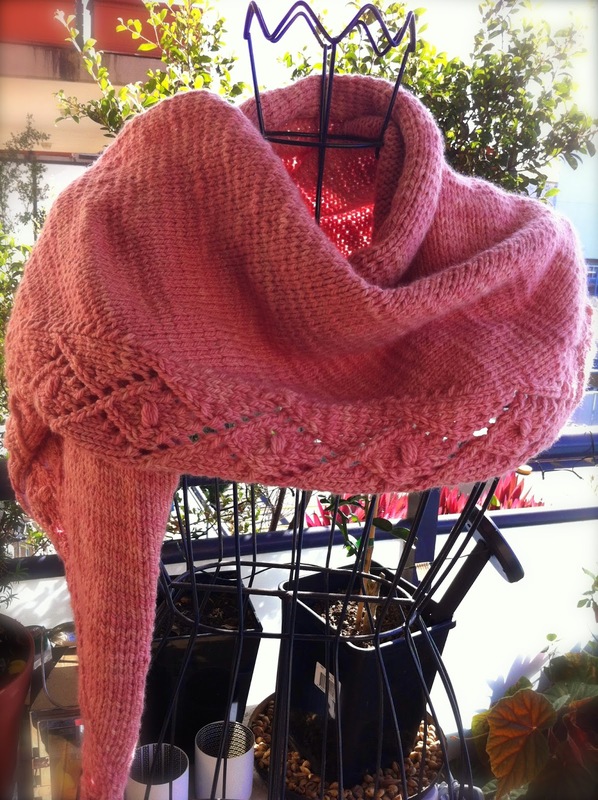 There is one more hat with a pink strip around the edge from the Powderpuff Suzyhausfrau Aran. However, I can't find a photo of that. It was dark green with a narrow strip near the border which used up the very last of the oink from the Acadian shawl. This photo of the Acadian shawl was taken a couple of days ago when it was straight off the needles and as yet unblocked. There was a break in the grey light outside, so I took advantage of that. The pattern is free on Ravelry, easy to do. The yarn is lovely to work with, soft and pleasant through the fingers. It's also very warm. The wrap is still unblocked. The weather has been damp. when it wan't damp, it was wet. The yarn is thick and I didn't want it hanging around for days to dry. It will be snug and cosy now that winter seems to be finally arriving. I said that I was going to try for two hats a week. 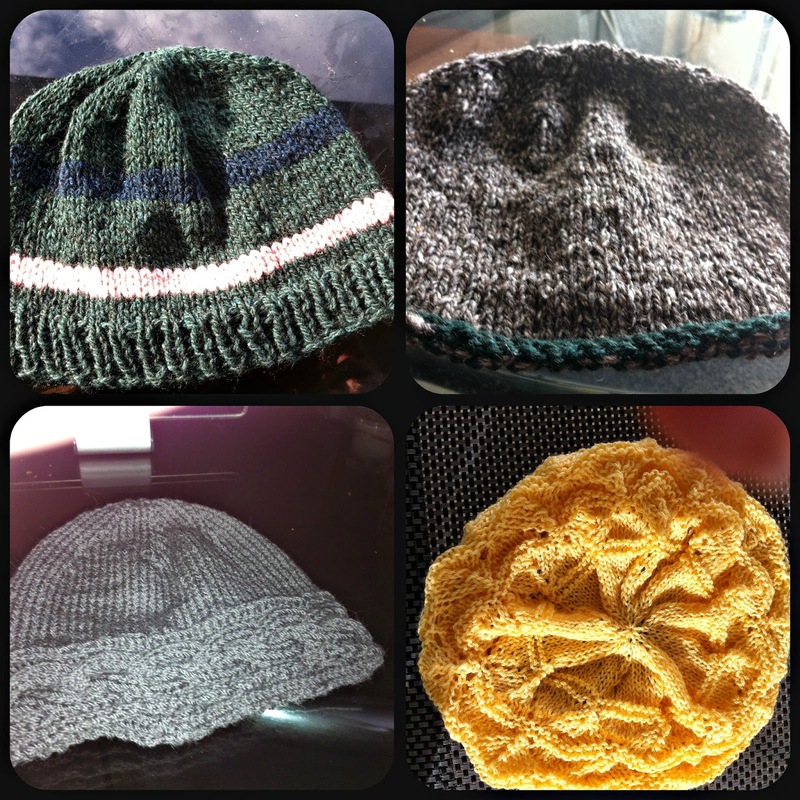 This is four hats over three weeks. Arthritic fingers and other joints didn't help. However, I can't let it bother me if I don't keep up. My knitting is not meant to produce anxiety for not keeping to the standards I originally set. Any hat is another little head kept warm and is better than no hat at all. Knitting is a means of relaxation and meditation for me and it isn't that if I worry about keeping up. I have been using my swift a lot lately. 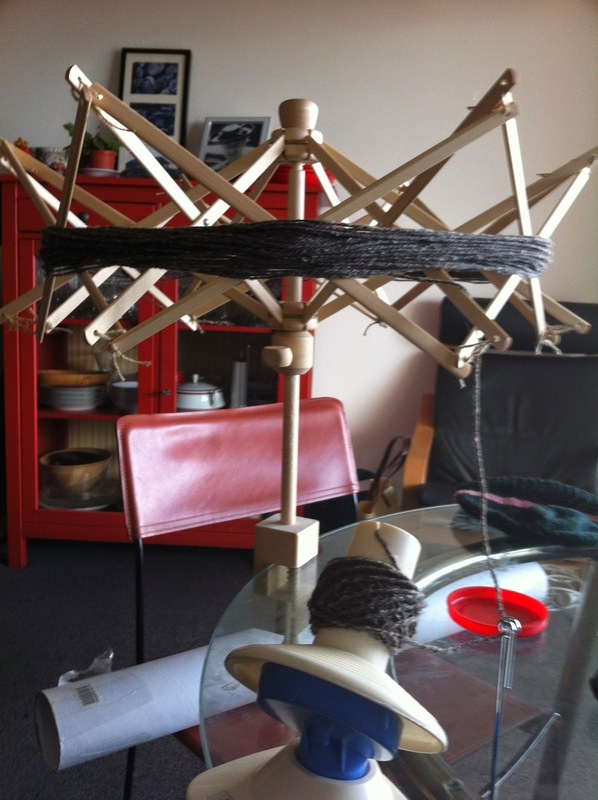 I love it and it has made winding yarn ever so much easier. I used to use one end of the rectangular table on the balcony to hold the yarn but this is so much quicker and I now have a different table. The ball winder is great, but it slips a bit on my glass table. I think I will try a bit of non-slip rubber on the top as well as the base of the clamp. Miss M seems to be well and is certainly enjoying three weeks without being admitted as an inpatient. Next week sees the start of the last few weeks of the intensive chemo which started on New Year's Day with the diagnosis. That is another eight weeks. If all goes well, there will be clinic administered maintenance doses and regular testing after that for a very long time. Some years. If she becomes sick with any infections, she has to be taken straight to hospital for monitoring as an inpatient, as the body has little to fight infections. For a moment I thought you were knitting Agents of Shield Hydra hats, then I realised it was classical Hydra!! Gorgeous shawl, it looks snuggly and stylish and I know how much the hats are appreciated. You are very kind. Indeed, you do know your wool!! I hope your arthritis settles down and what a very sensible attitude to knitting: once it becomes a task it is no longer fun. Good news about Miss M, I am so happy for her and for you!! Wonderful, and I hope she makes it through this last round with flying colours!! Your shawl looks lovely, even unblocked.